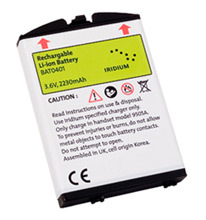 Whether you need to replace the old battery or thinking about getting extra one for an upcoming trip to a remote area, this Li-Ion rechargeable battery pack for Iridium 9505A satellite phones will always be handy. Continental United States: Select UPS Ground shipping for battery orders. Do NOT use USPS Priority or any UPS express methods. NO battery shipping outside the continental US: We will NOT ship orders containing stand-alone li-ion batteries to anywhere outside the continental United States, including Alaska, Hawaii, Puerto Rico, Guam and all non-US destinations. Please contact us if none of these options is applicable or you require a large quantity of batteries. If these guidelines are not followed, your order will be delayed and cancelled.